Anouska and all of the team at the Miners Arms would like to welcome you to our friendly establishment where we strive to serve good quality food with friendly and efficient service. The history of the Miners is the stuff of fiction. Over the centuries it has been a courthouse, a venue for inquests, a smugglers lair and even a house of ill-repute! Ghostly figures have been spotted skulking throughout the building, which fits in nicely with the various stories of lost chapels and monastic retreats which abound in this very old village. As you enter this unique 16th century pub it is like stepping back in time. Real beams and low ceilings are a feature of the Miners. Curiously, light streams through to illuminate the many colourful wall paintings. 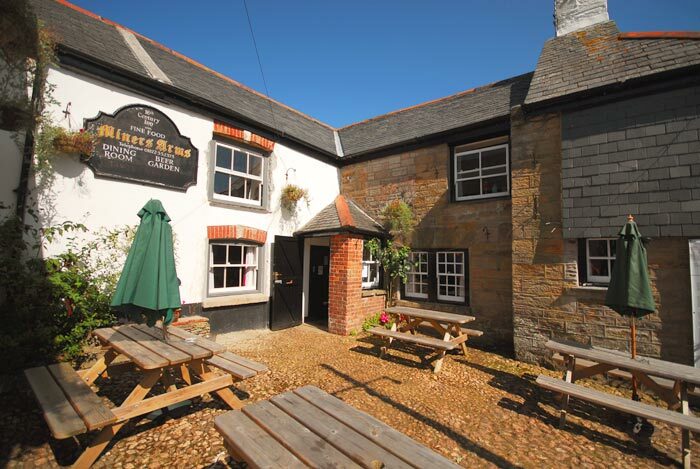 If you are looking for a traditional Cornish pub, serving real food in old world comfort then visit the Miners Arms at Mithian. All of our dishes are freshly prepared and cooked to order, using the very best of local Cornish produce whenever possible, to our uncompromising standards of taste, quality and presentation.